Luton Town failed to spoil League Two champions Northampton Town’s title party, falling to a limp defeat at Sixfields this afternoon. The visitors were cast in their role as guests at an event they would have much rather not been invited too, but two soft goals conceded in the first half meant they were never going seriously spoil the occasion for the Cobblers. True, Luton did improve in the second period, but by this time, the home faithful were already clearing their throats ready to hail the trophy presentation at the final whistle. After a guard of honour for their hosts, Luton then carried that generosity on to the pitch as inside three minutes, they conceded a goal of sheer simplicity, centre half Zander Diamond rising highest to meet a deep corner and plant his header beyond Elliot Justham. Danny Green tried to grab an immediate response, fizzing wide of the target, before the winger was dealt a sickening blow on 15 minutes, sliding in on Josh Lelan, only to be caught by the right back. Physio Simon Parsell was on the scene quickly and immediately called for the stretcher, signalling a break with his arms, as Green needed a good seven minutes of treatment, including oxygen, before being carried from the field, Josh McQuoid on in his place. The game took a while to come to life again after the injury, but Cobblers continued to look dangerous from every set-piece swung in, Justham pawing one away from near his own line. Town then wasted a glorious opportunity chance to level on 28 minutes as Pelly Ruddock Mpanzu skinned David Buchanan for pace and picked out Joe Pigott who with an open goal at his mercy, could only direct the fierce cross over the top. That miss was to prove crucial as on 35 minutes, Luton were 2-0 ahead when Ricky Holmes burst menacingly towards goal, fed O’Toole whose cut back beat Justham allowing John Marquis to tap into the unguarded net from close range. The Cobblers then really started to go through the gears, showing just why they had beaten all and sundry comprehensively this term, keeping possession for well over a minute, forcing Luton to chase shadows, with Buchanan’s eventual shot easy for Justham. Northampton were denied a third by the woodwork in injury time, as Sam Hoskins was teed up inside the area and had an age to weigh up his options, side-footing against the outside of the post. Town swapped Olly Lee for Jack Marriott at the interval, going two upfront, but despite starting with a renewed zest, Northampton almost made it 3-0 when McGeehan was robbed by the excellent Holmes. The Cobblers’ star player motored away and crossed for Hoskins who, under huge pressure from the recovering Dan Potts, could only slide wide. Back came Town and on 50 minutes, it was they who were left cursing the frame of the goal, when Pigott received Ruddock Mpanzu’s pass and spun impressively to unleash a right footed drive that cannoned off the post. The striker then went it alone with Stephen O’Donnell of all people in the centre forward role, his effort blocked by the covering Buchanan. 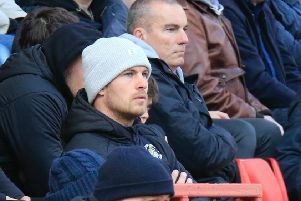 Marriott’s introduction opened the game up immeasurably though as Luton finally came to life, although their extra forward options gave Cobblers chances too, with the hosts wasting more than one fine break. Hatters kept creating openings, this time for Pigott again, as he couldn’t find the target after the ball broke to him on the angle, screwing a first time effort wide. Like the typical NBA basketball game, it was a case of you attack we attack and on Cobblers’ turn, Holmes threaded a wonderful pass through through the heart of Town’s defence, with Hoskins letting fly, only to be denied by a fine save from Justham. With their initial burst weathered, Luton were then forced to watch Northampton ease through the final 20 minutes, before the celebrations started, Pigott seeing his consolation chalked off by the linesman’s flag, while Alan Sheehan curled a late free kick narrowly wide. Cobblers: Adam Smith, Zander Diamond, Nicky Adams (Lawson D’Ath 57), Ricky Holmes, Josh Lelan, Sam Hoskins (Jason Taylor 85), David Buchanan (C), John-Joe O’Toole, Luke Prosser, Danny Rose, John Marquis (James Collins 57). Subs not used: Ryan Creswell, Alfie Potter, Shaun McWilliams, Ryan Clarke. Hatters: Elliot Justham, Stephen O’Donnell, Dan Potts, Alan Sheehan, Glen Rea, Jonathan Smith, Olly Lee (Jack Marriott 46), Cameron McGeehan, Danny Green (Josh McQuoid 21), Pelly Ruddock Mpanzu (Jake Howells 84), Joe Pigott. Subs not used: Craig King, Frankie Musonda, Paul Benson, Alex Lawless. Booked: Lelan 15, McGeehan 72.